Wedding gift amount etiquette is a topic that has been discussed with set amounts one should give the happy couple. It is important to remember that the gift is a representation of your love for them... no matter what it costs. Many wedding experts will tell you that you need to spend at least $50 on a wedding gift, and even more if you are really close to the couple. It has been mentioned that one could give a gift of up to $1000 if the budget allows. I haven't met too many people that have an extra $1000 laying around for a wedding gift. It is not good wedding gift etiquette for a couple to ask for money or gifts when they invite loved ones and friends to their wedding. It is an opportunity for those invited to help the couple start their lives with the gifts that they choose. Wedding gift etiquette states that if you are invited to the wedding you should present the couple with a gift. 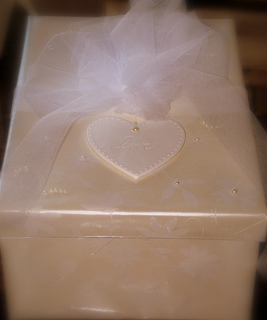 It is appropriate to send the gift to the couple or a parent before or after the wedding. If you choose to give the couple money, you can give the card to them during the reception. When you are deciding how much to spend on a gift, the most important thing you need to do is look at your budget. Also, be mindful of how many weddings you will be invited to during the year. Purchasing multiple wedding gifts in a year can add up quickly, especially if you are invited to bridal showers as well. Also, you need to take into consideration the amount of travel you will need to do in order to attend the wedding. If you are traveling some distance to the wedding, those costs will need to be factored into the budget amount you have for the wedding gift. The bride and groom will be so grateful that you took the time and expense to attend their wedding, they will not be expecting an extravagant gift. Once you have looked at your budget and determined how much you have to spend, get creative. Take what you know about the bride and groom and find a gift that is either on the registry, or one that you know they will enjoy. Our favorite gifts from our wedding weren't the ones that were really expensive. They were the little ones that came from the heart of the guests. After 13 plus years of marriage, we still know who the gifts were from. Wedding gift amount etiquette comes down to what you, the guest can afford. For those you are really close to, it is appropriate to do more for them, if you can. The bride and groom will show their good wedding manners by being grateful for anything and everything that they receive.